Sandra M. Cotter is the Director of Dykema's Regulated Industries Department and Leader of the Government Policy & Practice Group. Ms. Cotter's practice focuses on insurance regulation, litigation, and legislation; liquor licensing and compliance; campaign finance and election law; public policy litigation and legislation; and general corporate work for profit and nonprofit corporations. She has frequent contact with Michigan's executive office, state legislators, and various government agencies, including the Department of Insurance and Financial Services and the Michigan Liquor Control Commission. 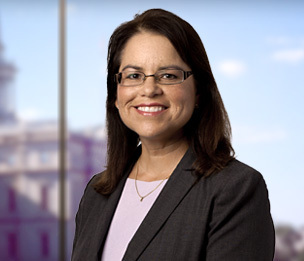 Ms. Cotter has been involved in drafting complex legislation and administrative rules on a variety of matters including insurance, liquor control, economic development, and environmental regulation. She is skilled in helping clients formulate solutions through regulatory and legislative means. Ms. Cotter is also a registered lobbyist agent in Michigan. While at Michigan State University, Ms. Cotter worked for the U.S. Cooperative Extension Service and served as a page and legislative assistant for the Michigan House of Representatives; while attending law school, she taught in the Minority Affairs Program at the University of Michigan. Appointed as a Special Assistant Attorney General and was part of the Dykema team that represented the State of Michigan in privatizing the State Accident Fund of Michigan. Responsible for drafting legislation to enable the state to sell the workers compensation insurer and working with legislators on adoption of the legislation. Ms. Cotter was also part of the transactional team negotiating the $291 million privatization. In the 2008 Michigan general election, Ms. Cotter was involved in both statewide ballot initiatives to appear on the ballot. She represented both the Michigan Citizens for Compassionate Care on the medical marijuana initiated law and CureMichigan on the constitutional amendment to allow for stem cell research in Michigan. Both measures passed by significant margins at the November 4, 2008 election. Served on the Michigan Natural Resource Management and Environmental Code Commission which successfully codified statutes affecting natural resources and the environment. Significant experience before the Michigan Liquor Control Commission on liquor licensing and regulation matters affecting retailers, distributors, and manufacturers. Appointed to the Saginaw Valley State University Board of Control in 2002. While on the Board, the University's accreditation by the Higher Learning Commission of the North Central Association of Colleges and Schools was renewed and Ms. Cotter was part of the administrative team involved in the accreditation in 2004.